The creepy cane spider is also known as the Large Brown Spider, usually the size of a tuna fish can. Its spider bite is usually small and not poisonous. A cane spider bite is usually small and does not cause any health problems to person bitten, even in the long run. Cane spiders are typically not aggressive when threatened; they prefer to run instead of defending themselves when confronted. They only bite when cornered or have nowhere to go when assaulted. 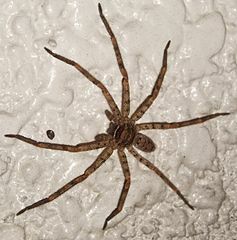 The creepy cane spider is also known as the “large brown spider“ and is usually the size of a tuna fish can. They are abundant in the Hawaiian islands and can usually be found in the cane fields. This is true! Imagine yourself driving through an abandoned cane field, in no time your vehicle will most likely accumulate cane spiders. There is nothing to panic about when bitten by a cane spider. Its bite will not harm a person. The cane spider does not produce enough poison to endanger a human being. However, if bitten by a cane spider, the victim may experience headache. Generally, can spiders are harmless. In fact, there are some cultures who keep cane spiders in their homes to get rid of cockroaches. Identifying what kind of spider bit you is important. You can distinguish the cane spider by its large and flat body that is about an inch long. It has two rows of eyes. Its legs are long and hairy. The leg span can reach up to 5 inches wide. Cane spiders can be brown, with a cream color band encircling the back top. They also have black spots or bands on the legs. Pale patches behind the eyes and longer legs are common among male cane spiders. Female cane spiders are quick to be identified with their large abdomen. Because cane spider rarely bites, oftentimes they run away from predators. However, they can be aggressive during mating season and this is probably the only time you could get bitten by cane spiders. The bite from a cane spider is small. It does not pose any risk to human beings. It can be compared to a bite of any non-poisonous insect. However, first aid for the spider is still highly recommended to prevent infection. Administering first aid to a cane spider bite is necessary to minimize irritation and infection. Simply clean the area with soap and water. Then apply cold compress or ice wrapped in cloth for about 20 minutes to reduce swelling. Apply antiseptic or antibiotic ointment to avoid infection. Bandage to protect and cover the bite.